Kyoto’s Otoboke Beaver return with a new album offering! “ITEKOMA HITS” released on Damnably Records! Consisting of 8 newly recorded tracks with new member Kahokiss who officially joined late August in 2018, taking over drumming duties from former drummer Pop. With 8 tracks recorded at Osaka’s LM Studio by Ippei Suda who also mixed and mastered the album, plus 6 older tracks recorded at Studio Hanamuaii by Kazutaka Miya, and produced by the band. The album is full of the band’s signature turn-on-a-dime, deranged timings and angular punk-rock-pop-garage fury. With a fresh transfusion from their new member, the band exude even more energy, playing faster and harder than ever, and each members’ musicianship has room to shine on Accorinrin’s keen compositional skills. Lead track datsu.hikage no onna translates as “Break out, kept woman”, and continues the narrative of anata watashi daita ato.., this time imploring the subject to come out of the shadows and escape from this toxic relationship for good. Don’t Light My Fire’s Japanese title (‘HEART ni hi o tsuketanaraba chanto keshite kaette’) translates as “If you set my heart on fire, put it out and go home”, deals with the contradictory nature of head vs heart, when you know this is not going to be good for you, yet a part of you desires it. The only way to deal with this of course, is to yell a firm no, or even “GO TO HELL”. 6 Day Work Week Is A Pain is commentary on workforce culture and Binge Eating Binge Drinking Bulimia reflects on lacking self-control, and underlying issues that contribute to it. I’m Tired Of Your Repeating Story is a cathartic anthem for anyone who has ever been mansplained at. Otoboke Beaver are a punk-rock-garage quartet from Kyoto, Japan. Formed at Kyoto University’s music club, the band consists of Accorinrin (Lead Vocal & Guitar), Yoyoyoshie (Guitar & Vocals), Hirochan (Bass & Vocals) and Kahokiss (Drums & Vocals). 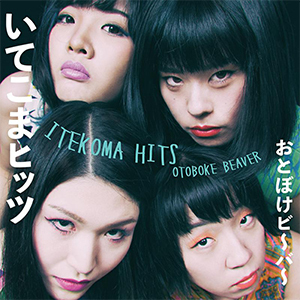 This entry was posted in Featured Album and tagged damnably, itekoma hits, otoboke beaver.